With Supplement #7 to the two-volume treatise Global Privacy and Security Law, a new milestone will be reached. Three new country chapters will be added: Costa Rica, Paraguay, and Peru. With this addition, the Global Privacy and Security Law treatise will cover the data protection laws of 65 countries on all continents. In addition, to the three new chapters, we are providing updates to 25 of the existing chapters. Sent to subscribers October 2011. Supplement #6 includes updates to twenty one chapters. 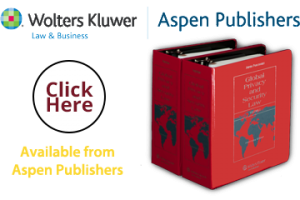 There have been changes and new rules in many countries in the Asia Pacific Region, the Americas and in Europe, the corresponding chapters have been updated to reflect these developments. In particular, the chapters of countries in the European Union have been updated to reflect the status of implementation of the 2009 Amendment to the 2002 e-Privacy Directive. Also, the chapters on the 1995, 2002, and 2006 Directives have also been revised, reorganized and supplemented with new information. Sent to subscribers in May 2011. Supplement #5 includes both updates to the foundation chapters and to the country reports. The foundation chapters are updated to reflect recent changes in several areas, including the proposed overhaul of the EU privacy framework. The reports for 19 countries are updated as a result of changes or proposed changes in the national laws of these countries. Sent to subscribers in January 2011. Supplement #4 provides updates to several country chapters to reflect recent developments. Chapter 9 reflects the addition of the Faroe Islands as a country that provides “adequate protection” of privacy rights and personal information. The updated country chapters include Belgium, Brazil, Bulgaria, China, Cyprus, Dominican Republic, Finland, France, Israel, Italy, Malta, Poland, South Korea, Spain, Switzerland, and Taiwan. Sent to subscribers in September 2010. Supplement #3 increases the number of countries covered in the book to 62 countries by adding two new chapters. Supplement #3 also provides updates to Chapter 2 and Chapter 5, updates on new laws and new developments in several countries, and adds a new appendix. Sent to subscribers in May 2010. Supplement #2 increases the number of countries covered in the book to 60 by adding two new chapters. Supplement #2 also addresses major changes in the European Union; provides updates on new laws and new constitutional developments in several of countries; and adds a new appendix. Sent to subscribers in January 2010. Supplement #1 brings to 58 the number of countries covered. We added Monaco and Morocco, both of which enacted a new data protection law in 2009. We are also providing an update to the German chapter in order to address the changes to the German Law that became effective in September 2009. Finally, the Czech Republic chapter was substantially and materially augmented to provide more detailed information and references.